Painting giant robot in destroyed city. 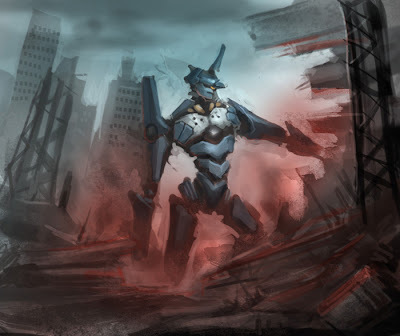 Learn how to draw mech or mecha Giant Robot sci-fi design Anime, Manga and comics concept illustration: video step-by-step tutorial with instruction online. Step by step how to start sketching the initial idea, drawing, blocking in shape, background and rendering. The video demonstrates how to quickly create an efficient concept design from concept idea into visual. How to put rough idea onto the paper sketch and create sci-fi character concept art online lesson for comics cartoon illustration, manga, and anime. thanks....i rally appreciate your help and must of all your art. 1) DO NOT ERASE, this is DIGITAL so nothing gets muddy...Instead you CAN PAINT OVER over with whatever color you want. ***this is what distinguish when people transition from drawing to painting (real medium), and digital painting everything is out the door. 2) Yes use separate layer for background, but then..mid way I merge everything down and paint over the background...you get real cool effect that way for the final result. When paint over make sure the use 100% opacity for nice clean color. thanks a lot....really helped me out. By the way...love the site...please keep teaching us(well as least me), you are great and not that many people with your abilities put so muh effort on doing something like this. how did you do that on the red part??? Anonymous> If the values you lay down at the initial state works! Then keep it. Red part? is just overlay or multiply, play with it.